Many, many years ago – when Caitlin broke my heart in that terrible way teenage way girls do – I wept and wept and wept and wept and spent the summer trying to decipher the lyrics to Life’s Rich Pageant. Apparently I thought making sense of “Swan, Swan, H” would heal a broken-hearted me. Little did I know that two decades later I’d be sharing a movie poster with the man who concocted those very lyrics. A man whose Christmas party I’d crashed twice. Ladies and gentlemen, Michael Stipe made millions stringing random words together. Do you think he’d go wrong with a 56-minute documentary called Johnny Berlin? Of course not. No doubt, you’re wondering what Johnny Berlin is, exactly. 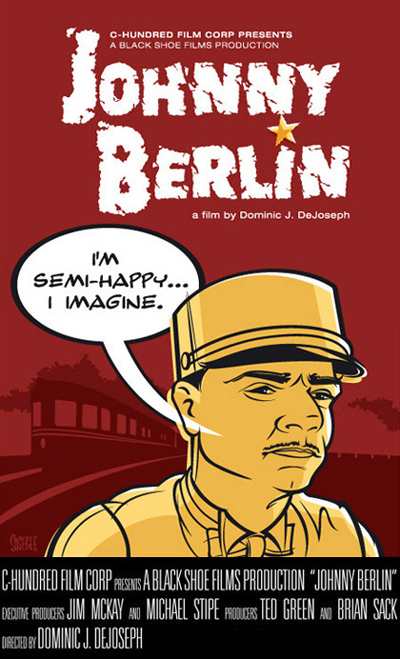 Johnny Berlin is a refreshingly funny film directed by Dominic DeJoseph; executive-produced by Michael Stipe and Jim McKay; produced by Ted Green and Brian Sack, who is me. Johnny Berlin is the true story of John Hyrns, a man who is real and real lost as people go – wandering from job to job, not really sure where life’s taking him. Intelligent, under-employed, somewhat abnormal. He’s an observer and commenter and an entertainer, but not really a do-er. In a very nice review, Variety describes Johnny as “at once fascinating and vaguely troubled.” True, that. We all know folks like Johnny. In this case, director Dominic DeJoseph happened to make a movie out of it. Johnny Berlin is showing this Tuesday, January 3rd, 9pm at the Pioneer Theater in the Lower East Side of New York, NY. The city, not the casino. We hope you live close enough to enjoy it. If not, we may screen it again. Or may not. It all depends on you, really.